Do you fight for your King's honor, or the glory of the Warchief? 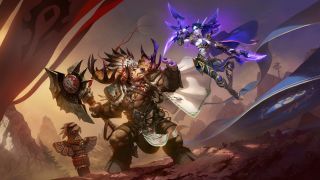 It’s time to revisit faction pride in World of Warcraft’s latest expansion, Battle For Azeroth. It has been quite some time since the Horde and Alliance haven't had to band together to defeat the likes of Arthas, the Burning Legion, and all sorts of villainous threats that have popped up in the Warcraft universe. When World of Warcraft first launched, a major part of the game was giving us the excitement to take up arms for our faction of choice. Being able to share a cause with your allies brought a level of kinship not normally found in other games at the time. Sure, there was a layer of animosity in being against another group, but with rule-specific servers like PVP and PVE, you could choose how much interaction you wanted with the opposite faction. Once we delved deeper into Azeroth, big baddies became the new threat. We were able to summon the strength of the Alliance and the Horde to vanquish the enemy. It was always a reluctant union of course, keeping the Horde and Alliance still at odds, but both were able to work together towards a solution. There are many differing opinions on the path Warcraft is taking, but returning to the bones of the game with faction warfare and allegiance feels nostalgic to those who remember. And those who joined the game later in its history are able to, from their eyes, experience something new. Highlighting the faction war feels visceral, especially after watching Blizzard’s cinematics and journeying through the pre-release content. Faction lore is front and center now. It’s a high stakes game, and Blizzard has given special attention on their new advanced AI feature to make encounters even more challenging. The island expeditions feature rolling out with the expansion will place a major focus on finding Azerite on randomly generated islands. Each island is different, with varied objectives and creatures to take on that puts a spotlight on strategy and communication. Fighting for Azerite, the precious “blood” of Azeroth, will be a big deal on August 14th. It gives us a task of not just collecting this potent material, but to intercept the opposing factions’ own pursuit for it. Furthermore, with the island expeditions and advanced NPCs being introduced, players can search for Azerite on maps designed to feel original, with fog of war exploration and new, more challenging monster mechanics. Fighting through groups of enemies on the islands gives us the chance to feel personally responsible for our faction’s success. With the focus on faction conflict, even creating a character will feel more impactful. Your identity won’t simply be from choosing long horns on a Draenei, or cute pigtails on a Blood Elf; it will be choosing your character’s individual ambition as well. In addition, lore and storylines will now feel personalized depending on what faction you choose. With two new zones, Kul Tiras and Zandalar, we can experience exclusive quests not shared with the opposing faction. Things are headed for a boiling point for the denizens of Azeroth as the expansion grows closer. Be it a proud member of the horde or a noble member of the alliance, Blizzard’s Battle for Azeroth will no doubt keep us on our toes.